I hope you're in the mood for adorable glitter, because that is what I'm bringing you today. 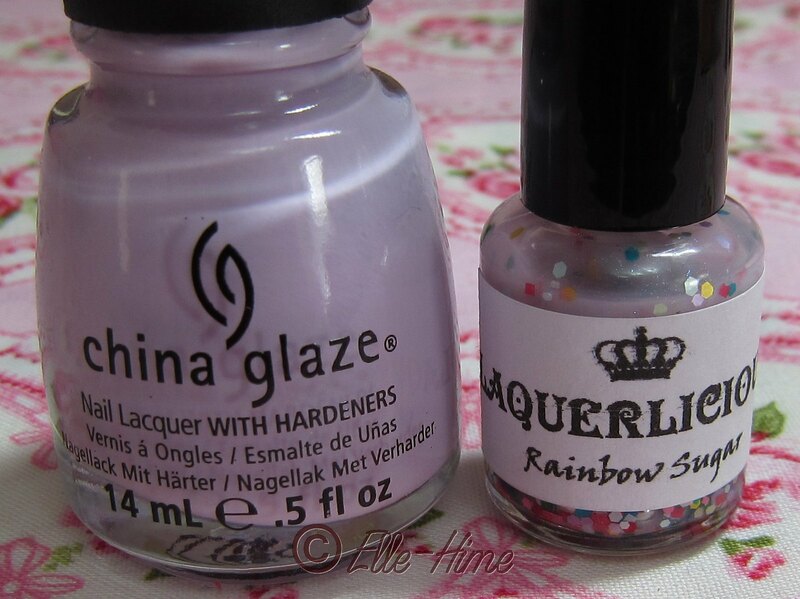 I was sent a mini bottle of Laquerlicious Rainbow Sugar to try out and review, and for starters I'm wearing it over two coats of China Glaze Sweet Hook, one of my favorite pastel cremes. As far as I could tell Sweet Hook was the closest color to the jelly in Rainbow Sugar. I wanted my nails to resemble the polish in the bottle as closely as possible this time. Rainbow Sugar is a very sheer jelly glitter, and I'm sure it could be layered over any color, or even used for a funky French manicure (which I really want to try now). Speaking of the glitter, I love the mix of colors in this polish! It is a wonderful blend of pastels and brights, and the finishes are satin or matte so they go together really well. The hex and square shapes definitely lend themselves to the sugar sprinkle look, too. The glitter isn't super dense, but I only used one coat and really liked the feel of it. I did have to fish for the glitter a little bit but I think a major reason for this is working with a mini brush. The glitter was easy to place and didn't have issues clumping in one spot. To top off all the glittery goodness this polish has a fine light blue shimmer through it, and it spreads perfectly on the nail for a really nice finish. Laquerlicious polishes are sold on etsy. So far I'm loving the ones I'm testing, what do you think?